An ultrasound machine uses sound waves to image parts of the body, including breast lumps. The sound waves are transmitted through a probe, which is placed over the breast. Lubricating gel is placed on the breast skin to improve contact and does not involve radiation exposure and therefore ultrasound scans are harmless. The sound waves are reflected within the breast back to the ultrasound machine, which transforms them into a computer image viewed on a display monitor. 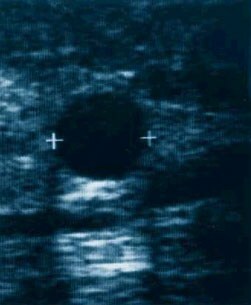 The ultrasound examination is carried out by the radiologist, who decides whether the lump is a cyst (bag full of fluid) or a solid lump (Figure 5). A solid lump is more likely to be a cancer, particularly if it has irregular borders, vertical orientation and an increased blood supply. A breast cyst can be treated straight away using a needle and syringe. Ultrasound is highly accurate in distinguishing cysts from solid lumps, and in assessing the lump size. Ultrasound examination does not usually cause pain, but occasional mild discomfort may be experienced due to the ultrasound device pressing against the breast. This is particularly true if the scan is performed around the time of the period in a younger woman. Ultrasound scan is recommended in all women who have breast lumps. As mentioned earlier in the section entitled Mammography (Breast X-ray), mammograms (Figure 6) are less accurate in young women (below the age of 35). Therefore the specialist may not suggest this test in a younger woman who has a lump in the breast, unless there is a very strong family history of breast cancer or the lump is suspicious. A cancer usually appears as a white shadow with an irregular edge and with breast distortion, or as fine white spots (called micro-calcifications). It is important to know that a normal mammogram does not exclude cancer – up to 15% of breast cancers are missed by mammography. Digital mammography with computer-aided detection and 3D reconstruction (Tomosynthesis) have been recently introduced to improve accuracy and reduce recall rates. The technology achieves better image quality and allows easier storage, transmission and manipulation of images. This test is performed under local anaesthetic using a wide needle (wider than that used in the fine needle test mentioned earlier) to allow a larger number of cells to be collected. 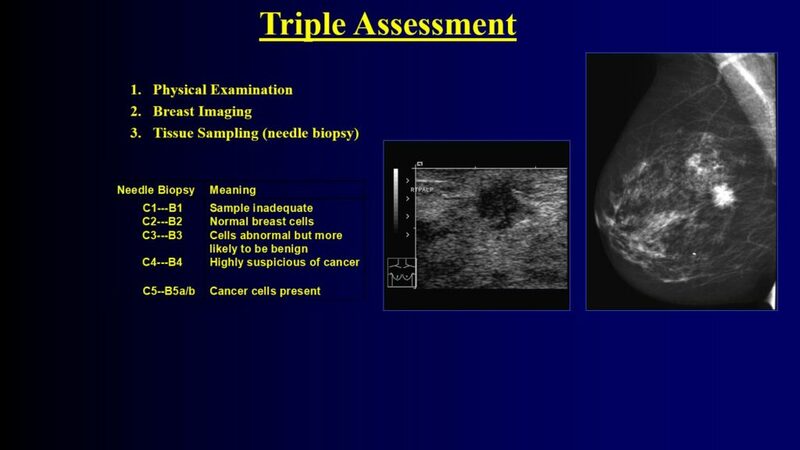 The test causes more bruising than the fine needle test, but has the advantage of distinguishing between invasive and non-invasive breast cancer and providing more details regarding the cancer. If the physical examination, needle biopsy, mammogram and ultrasound scan do not detect a cancer, then the breast lump can be safely left alone if the patient so wishes, provided that the lump is re-evaluated in six months’ time. If the lump increases in size or becomes larger than 4cm then surgical removal is recommended. In many breast units, it is often possible to undergo all the tests mentioned above and obtain the results on the same day. Such clinics are called ‘one-stop breast clinics’.